*sāwel-, Proto-Indo-European root meaning “the sun.” According to Watkins, the *-el- in it originally was a suffix, and there was an alternative form *s(u)wen-, with suffix *-en-, hence the two forms represented by Latin sol, English sun. 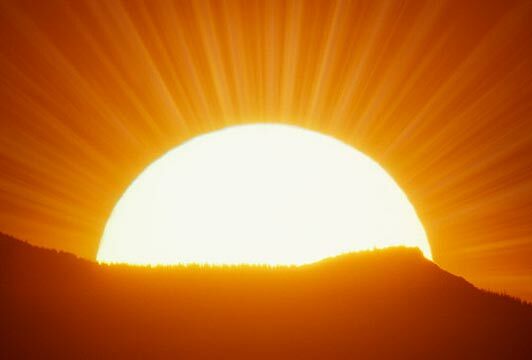 It forms all or part of: anthelion; aphelion; girasole; heliacal; helio-; heliotrope; helium; insolate; insolation; parasol; parhelion; perihelion; Sol; solar; solarium; solstice; south; southern; sun; Sunday. Old English sunu “son, descendant,” from Proto-Germanic *sunus (source also of Old Saxon and Old Frisian sunu, Old Norse sonr, Danish søn, Swedish son, Middle Dutch sone, Dutch zoon, Old High German sunu, German Sohn, Gothic sunus “son”). The Germanic words are from PIE *su(e)-nu- “son” (source also of Sanskrit sunus, Greek huios, Avestan hunush, Armenian ustr, Lithuanian sūnus, Old Church Slavonic synu, Russian and Polish syn “son”), a derived noun from root *seue- (1) “to give birth” (source also of Sanskrit sauti “gives birth,” Old Irish suth “birth, offspring”). Next Post: Can the ‘Yellow Vests’ Protests Go Global?